Do you snore? Does the person sleeping next to you snore? If so, did you know that snoring can be a symptom of an even bigger problem? Obstructive sleep apnea could be the cause of your snoring. This disorder is characterized by disruptions in breathing lasting 10 seconds or more, leading to serious health complications. Moreover, these lapses in breathing can happen more than 100 times in one night! Although you will likely be unaware of these moments when breathing stops, your brain is aware. Lacking oxygen, the brain signals the body to awaken to restart breathing. Why Choose Robison Dental Group for Sleep Apnea and Snoring Therapy? With sleep apnea, you won’t remember your breathing stopping over and over, but this vicious cycle adds up to a lot of lost sleep night after night. In fact, aside from snoring, one of the main signals that may indicate sleep apnea is daytime sleepiness and difficulty concentrating and remembering. 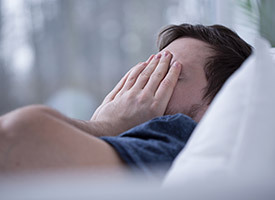 Other symptoms of sleep apnea include morning headaches and sore throats, gasping for air during sleep, and frequent trips to the bathroom at night. Dr. J.D. Robison and his team at Robison Dental Group can help diagnose and treat your sleep apnea and alleviate snoring. We can create a custom oral appliance that can help you start getting refreshing sleep again. This comfortable plastic appliance repositions your jaw to leave the airway open during sleep. This appliance is simple-to-use, travels easily, and is a non-surgical, quiet treatment option that has been proven successful for treating mild to moderate snoring and sleep apnea as well as providing an alternative for patients who are CPAP intolerant. If you believe you might be suffering from sleep apnea, please call 734-453-4530 for an appointment.